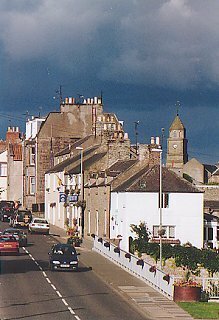 A large village of Berwickshire in the Scottish Borders, Coldstream lies at an important crossing on the River Tweed, 14 miles (22 km) southwest of Berwick-upon-Tweed. A Cistercian Priory was founded here in 1165 by Earl Gospatric and, prior to the building of a bridge, its inn was often used by royalty waiting to cross the Tweed at low water. The ford was used on many occasion by invading armies including those of King Edward I of England (1296), Robert the Bruce, King James IV (en route to Flodden Field in 1513), the Earl of Hertford (1545), the Marquis of Montrose (1640) and General Monk (1660), who was Oliver Cromwell's military governor of Scotland. In 1659 Monk raised a Regiment of Foot in Berwick-upon-Tweed but made its headquarters in Coldstream. On 1st January 1660, this force set out for London on its famous march, resulting in the restoration of Charles II. Only in 1670, after Monk's death, was the regiment named the Coldstream Guards after the place from where it had set out. In 1611 the Home family acquired the Hirsel on the western outskirts of the town, which is now the seat of their Earldom. Coldstream received a charter as a burgh of barony in 1621, although this status was lost with local government re-organisation in 1975. John Smeaton (1724-94) built the fine seven-arched Coldstream Bridge over the Tweed just to the east of the town in 1767. A Common Riding takes place annually in early August as part of Coldstream Civic Week. As part of this celebration, a young man known as the 'Coldstreamer' leads a line of horsemen over the border into England to lay a wreath at the Flodden memorial. In addition to tourism, local industries include papermaking and agricultural engineering. Coldstream is a picturesque settlement, with some fine public buildings. Its facilities include a cottage hospital, primary school, museum and a 9-hole golf course which lies within the adjacent Hirsel Country Park. The Coldstream Museum highlights the history of the Coldstream Guards and is located on the site of its original headquarters.